There’s a reason new facilities aren’t being built in Illinois: In too many cases a business investment in Illinois doesn’t make financial sense unless Illinois taxpayers are paying for a chunk of the project. This system isn’t good for businesses, or for workers and unions that are losing jobs. Until Illinois makes the broad tax and regulatory reforms needed to compete for blue-collar jobs, businesses are going to keep expanding elsewhere or asking for tax breaks to come here. Amazon Inc. made an announcement May 25 of its plan to add 2,000 full-time jobs in Illinois by opening an additional warehouse in Joliet, Ill. Amazon will receive a tax break of $2 million per year to expand its facilities in Joliet. Amazon’s tax break of $2 million per year for 2,000 jobs is worth $1,000 per job per year. Did the tech giant need the tax break? Probably not. Is there a better way to attract companies like Amazon to the state? Yes, there is. The Amazon jobs are expected to pay just under $30,000 per year. With tax breaks equal to $1,000 per job per year, taxpayers in Illinois are subsidizing 3.3 percent of Amazon’s payroll costs. This type of subsidy could be eliminated if Illinois would get its regulatory house in order. 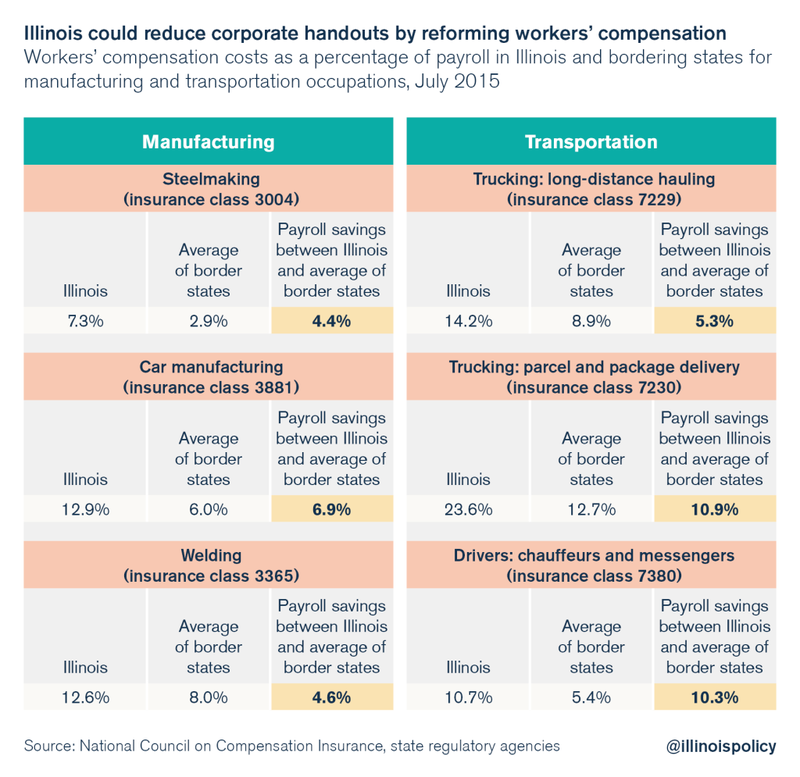 In fact, by fixing workers’ compensation alone, Illinois could likely eliminate Amazon’s claim of need for this subsidy. That’s because reforming Illinois’ broken workers’ compensation system would probably save Amazon, and other employers like it, just as much as it currently receives in taxpayer subsidies. Many Illinois businesses would save significantly more than 4 percent of payroll costs in manufacturing and transportation if Illinois’ workers’ compensation costs equaled the average of surrounding states Wisconsin, Michigan, Indiana, Iowa, Missouri and Kentucky. That’s compared to the 3.3 percent of payroll costs Amazon is receiving in tax breaks. Illinois can eliminate or at least dramatically reduce the corporate demand for giveaways like the Amazon tax breaks by reforming workers’ compensation and other regulatory hurdles that have the same anti-jobs effect. It is clear that an uncompetitive tax and regulatory environment puts Illinois in the position of having to pay businesses like Amazon to come here – just as Illinois offered special tax deals to businesses such as the Chicago Mercantile Exchange Group and Motorola Mobility to entice them to stay in the state. Although the examples above do not include warehousing per se, they use data from industries similar to warehousing. And all the data point to the reason new facilities aren’t being built in Illinois: In too many cases a business investment in Illinois doesn’t make financial sense unless Illinois taxpayers are paying for a chunk of the project. This system isn’t good for businesses, or for workers and unions that are losing jobs. Until Illinois makes the broad tax and regulatory reforms needed to compete for blue-collar jobs, businesses are going to keep expanding elsewhere or asking for tax breaks to come here. No one likes to see big businesses asking for taxpayer money. And even worse are job losses for hard-working Illinoisans struggling to make ends meet. But the solution to both of these problems lies in fixing Illinois’ tax and regulatory environment, and a great place to start is workers’ compensation.